DRI Review 2019: Is DRI a Good Hosting? I signed up to DRI, reviewed their unique features, tested how easy they are to use, checked with support on several issues, and tested the speed of the live site. When done, I tried to cancel my account and receive a refund. This is my experience with DRI - I hope you can learn from it. DRI hosting vendor has been offering web hosting services since 2001 to its customers based in France. It prides itself on hosting over 6,000 customers; from individuals to SMEs and even large business enterprises. The vendor’s web hosting solutions include managed services, cloud services, shared packs, domain names, and SSL certificates. 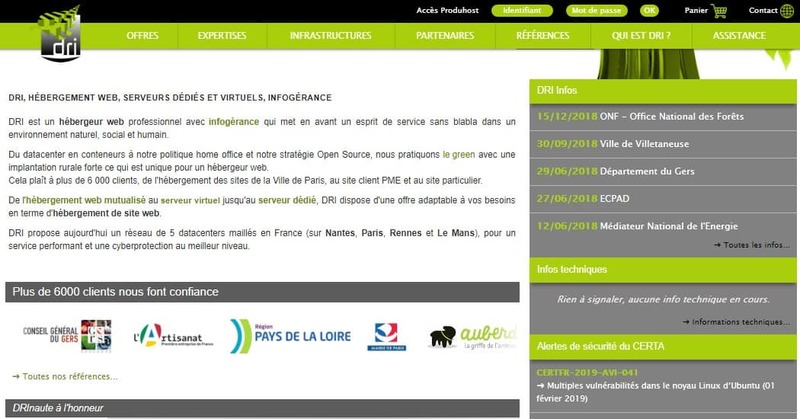 The DRI website is only available in French. DRI offers a network of five data centers located in France. The data centers are connected on an ultra speed 10Gbps loop with a total Internet transit capacity of more than 40Gbps for the delivery of high performance services. The vendor’s hosting packages are designed with the capacity to host a website of any size. The ACTIVITY plan is the starter package and comes with a disk space of 2GB and supports one database and one website. This package is best suited for small businesses. For professional and e-commerce businesses, DRI’s INTENSO + plan is designed with the necessary features to help you get started online. The package come with a disk space of 100GB, supports 50 databases, and a virtually unlimited number of websites. The company provides daily automatic data backups that are performed by an external backup server for easy file retrieval in case of a disaster. The backup files have a retention period of five days with an option to increase this to 30 days upon request. It is worth noting that this vendor’s hosting solutions do not include SSL certificates. Instead, the vendor offers these security services as add-on packages that users have to pay extra to obtain. DRI web hosting solutions are competitively priced. Hosting prices are listed in euros and have two billing options: monthly and annually. This hosting provider’s refund policy allows a customer to cancel their hosting at any time and get a refund for the remaining months of the current hosting period. Months that have already expired are never refunded. The DRI hosting infrastructure makes it possible for the vendor to offer a network availability guarantee of 99.95%. 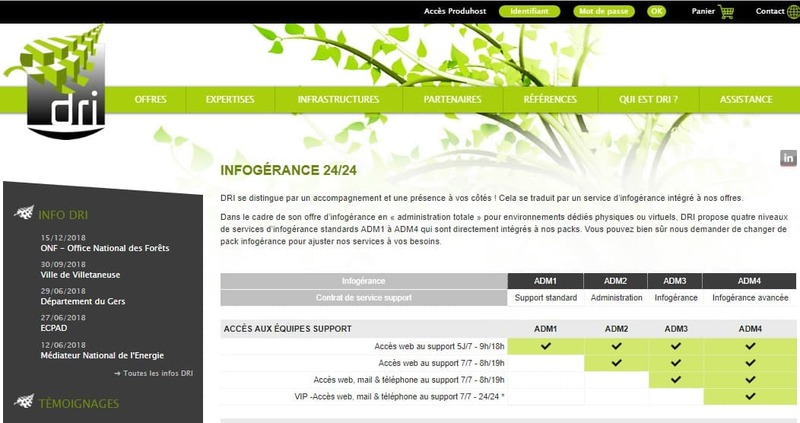 You can reach out to DRI’s customer desk via ticketing system. The vendor has not made available a support email, live chat, or phone number on its website. With such limited means to contact this vendor, it is not surprising that they don’t offer round the clock support. All the same, I inquired about their WordPress hosting solutions via the ticketing system and the support team never sent back a response. While the vendor is yet to put up a knowledge base on its website, it has an extensive FAQ section. DRI seems to have invested heavily in the infrastructure and expertise necessary to deliver secure and reliable web hosting services. The wide range of services and features make it a choice hosting provider for all types of businesses, including startups, professional, and e-commerce websites that receive thousands of visitors every day. Join the over 6,000 DRI hosting customers today! Wondering how DRI stacks up against other Web Hosting companies? Enter any other Web Hosting company and we will give you a side-by-side comparison.